I didn’t take this trade, but was actively watching. Still waiting for live account to be approved otherwise I would have taken this GU short. No directional bias, so trading as in level 3 accumulation, however first daily push down had already happened. Manipulation level 1.6419 was the current range low. Main issue with this trade which discounted it as a strict DTFL set up was the fact that the manipulation level had been broken only a few M15 candles earlier. This meant that any stops/orders would have been taken out by SM so there would be no reason for them to retest that level again. However, there were a number of confluences which made me think it was a viable trade; a perfect set of reversal legs at the manipulation level, coupled with yesterday’s low and the 200 EMA. Chad confirmed that it fulfilled the criteria that we’d be looking for but it would be considered an ‘aggressive’ trade. 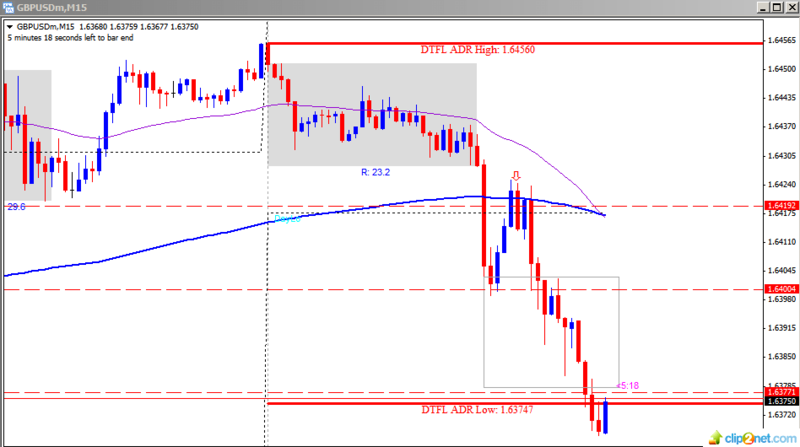 This short trade ran for 50 pips.